In December 1936 a new Soviet constitution was adopted, hailed by official propaganda as a “constitution of the victorious Socialism.” The period of transition from capitalist to socialist patterns was now declared over. The “socialist offensive” had resulted in the creation of a socialist society and the completion of the first phase of communism, socialism. The constitution formalized the new ownership relations and the rights and obligations of Soviet citizens. 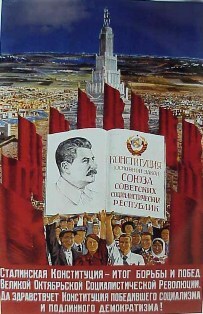 It referred to soviets of people’s deputies as the political foundation of the USSR, while public ownership of productive resources was proclaimed to be its economic base. It guaranteed the rights to work, rest, education, and many others. In its content, the constitution appeared to be an epitome of democracy. The electoral system to soviets of all levels was also changed: suffrage became universal, equal, and direct with secret ballot; and no categories of the population, except the mentally ill and convicted, could now be excluded from voting. In reality, however, the pseudo-democratic facade of “victorious socialism” masked a system in which the state exercised unlimited control, from politics to the economy. The economic basis of this system was proclaimed to be socialist on the claim that it was based on “public ownership.” In fact, the term public ownership masked the monopoly of state ownership, with the state acting as the supreme manager of nationalized productive resources. The state exercised control not just over the means of production but also over the very physical and spiritual existence of the individual. Stalin’s officials dominated the lives of ordinary citizens not only through terror but also because the state they represented became virtually the sole employer. By the second half of the 1930s the Soviet economy had taken on a significant labor-camp flavor. Forced labor acquired massive proportions, turning into a major factor of economic development. It was organized in the networks of reformatory camps and settlements run by the Chief Directorate of Reformatory Camps, better known by its Russian acronym, GULAG. The camps were set in remote and inhospitable areas of the arid steppe and above the Arctic Circle and provided cheap labor to develop new territories and natural resources in extreme climatic conditions. The convicts dug canals, laid rail track, built factories, mined gold, and felled timber. They produced nearly half of all Soviet gold, at least a third of platinum and timber, and contributed to one-fifth of major construction projects. Entire new towns were conjured up out of the ground by forced labor.